Building stairs is an important carpentry skill. 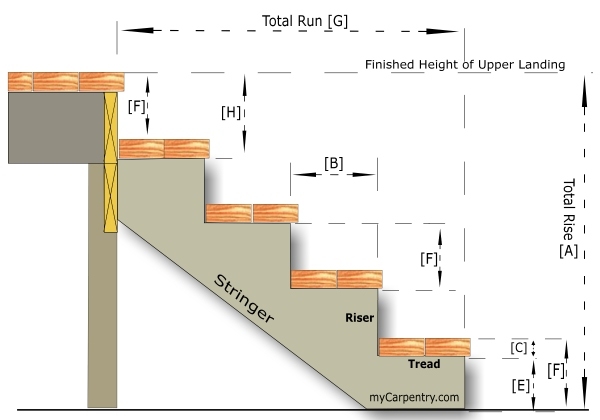 On this page, you will learn how to calculate stair stringer rise and run, and how to use those calculations to layout and cut stair stringers. 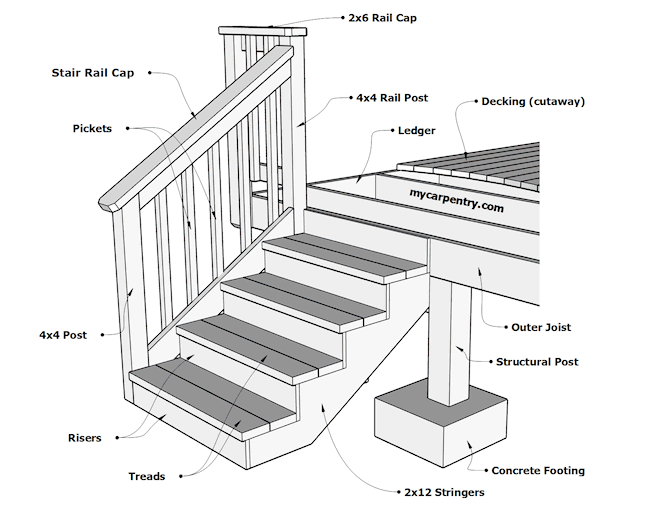 Check out Build Deck Stairs on the 10x10 deck tutorial for information about building stairs for decks. A Tread Depth (or step run) of 10 1/2" is ideal (I think) when using a single 2x12 or two 2x6's for tread material. I always try to design my stair rises as close to 7" as possible. 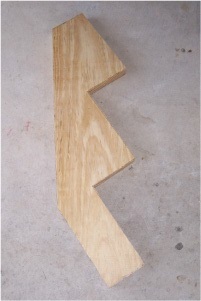 To calculate the number of risers for a typical set of stairs, first divide the Total Rise [A] by 7". You can use any number you want, but I will use 7" for this example, because that is my Target Step Height. 36.25" / 5 = 7.25"
Step or Riser Height = 7.25"
Total Run = 4 x 10.5"
The above stair run will have 5 risers at 7.25", and 4 treads at 10.5", resulting in a total run of 42". Note, that with this stair design, the last (top) riser is part of the landing or upper floor. Now that the number of treads (4), and the tread depth (10.5 inches), and the riser height (7.25 inches) have been determined, we have the information that we need to layout the stair stringers. Note: I recommend using the Stair Calculator to calculate your stair rise and run (as well as stair angle, stringer length, etc. ), but you can always do it the manual way if you prefer. 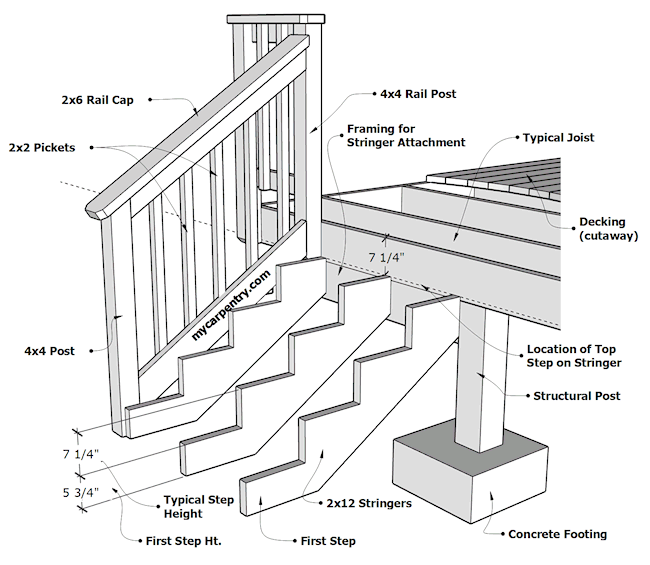 For information about building codes related to stairs, please check out this article called: Commonly Used Residential Building Codes. A very important part of building stairs is the layout of the stringers. The stringers should be cut from 2 x 12 framing lumber, #1 grade, free of knots. The images below show how a framing square is used to lay out the stringers [C], and a how the first stringer is used as a pattern for the remaining stringers [D]. This is very important, because if you layout each stringer separately, not only does it take more time, but the second or third stringer may not match up to the first if there are any variances in the shape of the board. Using the first stringer as the pattern for all of the remaining stringers will eliminate this potential stair building problem. To layout the first stringer, place a 2x12 onto some saw horses. Using the inside of a framing square, line up 10 1/2" on one edge of the 2x12 (about 6" from the end of the board), while also lining up 7 1/4" on the other inside edge of the square. This is the Step Rise and Step Run. Mark the 2x12 with a pencil, along the inside of the square, to layout the first step (see diagrams below). The first step on the stringer will be the Step Height minus the thickness of the tread material (so that when you add the treads later, all of the steps will be the same height). Assuming 2x12 for the treads, 7 1/4" minus 1 1/2" equals 5 3/4" (the First Step Ht). Align the square along the 10 1/2" line with the 90 degree point intersecting the 10 1/2" pencil mark, and draw a line all the way to the opposite edge of the 2x12 (see Stringer Material diagram below). Make a pencil mark along this line, 5 3/4" from the 10 1/2" point. Draw a line from the 5 3/4" mark, parallel to the 10 1/2" line, until you reach the opposite edge of the stringer. (see the Stringer Pattern in the diagram below) The first step on the stringer is now complete. To create the second step on the stringer, return to the first 7 1/4" mark on the 2x12. Align the inside of the framing square where 10 1/2" meets up with the first 7 1/4" mark, and align the other inside edge of the square at 7 1/4". This is the second step on this four-step stringer. Repeat this process until you have four steps on the stringer. 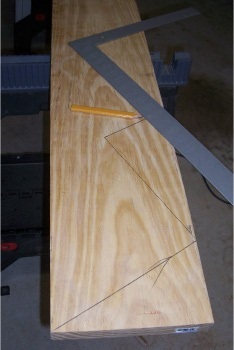 Now that you have the stringer is laid out, you can make the primary cuts using a circular saw. To avoid over-cutting too much into the stringer with the circular saw, the last part of the cut can be made with a jig saw or a hand saw. This is an important part of building stairs - cutting too much into the stringer can compromise the stair structure. Building Code typically requires at least 5" of uncut wood left on the stringer. 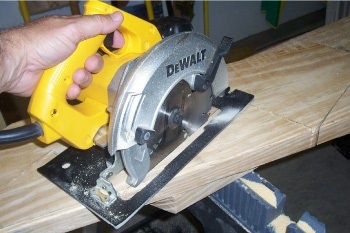 [E] Circular Saw - Use a circular saw to start the cut. Cut up to the layout marks, but not beyond. 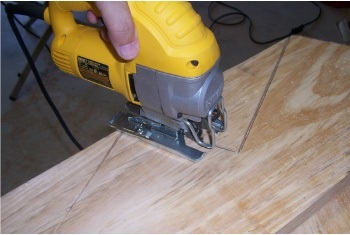 [F] Jig Saw - use a jig saw (or hand saw) to finish each cut. Note: The stringers shown in these diagrams above and below only have three steps, but the concept is the same regardless of how many steps you have. 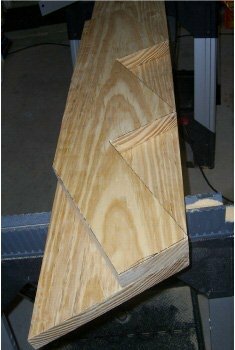 You should now have all of the information that you need to design and cut stringers for your own stair building needs. Of course, these are just the basics of building stairs. Building stairs with multiple landings and spiral stairs will take a considerable amount of design and planning.